Great universities are more than centres of learning and research. They are innovation engines that drive the development of new products, processes and services that go beyond business. They embrace charities, not-for-profits, public sector organisations and government to transform our local communities and the world. Cardiff University’s innovations are drawing international awareness, investment and jobs. The university’s new Translational Research Facility (TRF) will ensure this trend continues by providing a revolutionary laboratory and workspace where scientists and the private sector can collaborate on ideas that translate into tomorrow’s breakthrough discoveries. The Translational Research Facility is under development. The largest development in the latest wave of the Innovation Campus on Maindy Road, the TRF brings under one roof two of the university’s leading research institutes. Cardiff Catalysis Institute is one of the premier catalysis facilities in the UK. Its researchers collaborate with international scientists and chemical engineers in exploring advancements in areas such as fuel production and water consumption. Catalysts speed up chemical reactions, making key processes feasible, scalable and economically viable. They are the heart of nearly all industrial processes and products. The Institute for Compound Semiconductors is a bespoke facility for researching, testing and commercially developing compound semiconductor technologies that will drive our lives in the 21st Century, from the Internet of Things to robotics, autonomous vehicles, 5G and healthcare technologies. 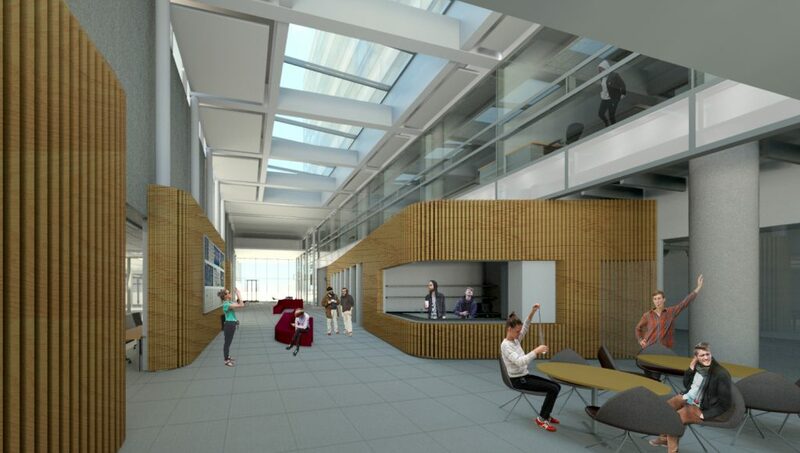 It is a flexible space, which, in future, may be open to internal and external partners. In addition to requesting a highly collaborative and technologically advanced facility for these institutes, the University challenged the HOK design team to create an environment that both inspired the imagination, fostered the health and wellbeing of building occupants and served as a showcase space for attracting and retaining top-tier students and researchers. Location challenges for the project included a long and narrow site located next to an active railway. HOK’s design creates a building tailored to the unique programming and identity of each institute while also providing common areas for collaboration and interaction. The 11,275 sq m building consists of three main volumes—a microscopy facility, cleanrooms and six-story laboratory—each equipped with institute-specific office and research space in addition to shared common areas and breakout zones. 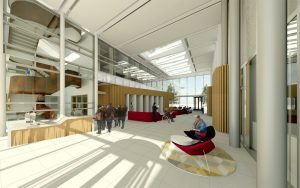 A central atrium connects the three masses and serves as a daylight-filled welcome area and event space where visitors can peer into labs to see the ground-breaking research underway. A canopy-covered entrance plaza, exterior rain garden and a green roof over the atrium offer additional space outside the building’s walls for serendipitous connections or quiet reflection. To mitigate vibration from the nearby railway, sensitive lab areas (such as those that house CCI’s advanced electron microscope capable of viewing matter at the sub-angstrom level) are located away from the tracks. Similarly, loading bays and other sources of activity and vibration can be found adjacent the rail lines and far from the building’s research areas and nearby residential neighbours. Few fields evolve faster than science and technology. The Translational Research Facility is designed to the highest current standards while also considering advancements decades from now. To ensure it remains energy efficient into the future, the building targets the stringent sustainability rating of BREEAM Excellent. Likewise, the facility’s modular layout and flexible design means lab and office spaces can be easily reconfigured to address future programming needs and changes. It is a design fit for future generations.